We said in the twenty-fifth Book of the first Year that the caps à la Turque could bring back the great mounted caps, which went so well with women's faces that they removed and ruined straw hats and chapeau-bonnettes, which most often uglified them, for the reasons we recorded, but which still broke them. One may judge between the two Busts shown in this Plate, if even the baigneuses, which are like the great mounted caps, do not perfectly suit. The baigneuse that the Woman dressed in a dawn-colored satin gown wears has large pleats and is made of striped white gauze. It is trimmed with a dawn ribbon with white stripes, which forms a large bow on the front. This Woman wears on her neck a full gauze kerchief en chemise, with three collars, held together with an arrow pin. In her ears hang gold rings à la Plaquette. Her hair is frizzed all over her head. Two curls which descend to the chest are allowed to escape on the side, and behind curls float à la Conseillère, fastened in the middle with a pin à la Cagliostro. The baigneuse worn by the Woman dressed in a puce satin gown is made in the shape of gauzes positioned on the head. The lappets hang behind with handkerchief ends. It is belted with a wide pink ribbon with black stripes, edged with black, which forms a very large bow on the left side, where it embraces a bouquet of artificial roses. This Woman's hair is frizzed like the other's. Like the other, she wears a gauze kerchief en chemise, fastened with an arrow pin. Also like the other, she wears gold earrings à la Plaquette, in the middle of which hangs a gold drop. 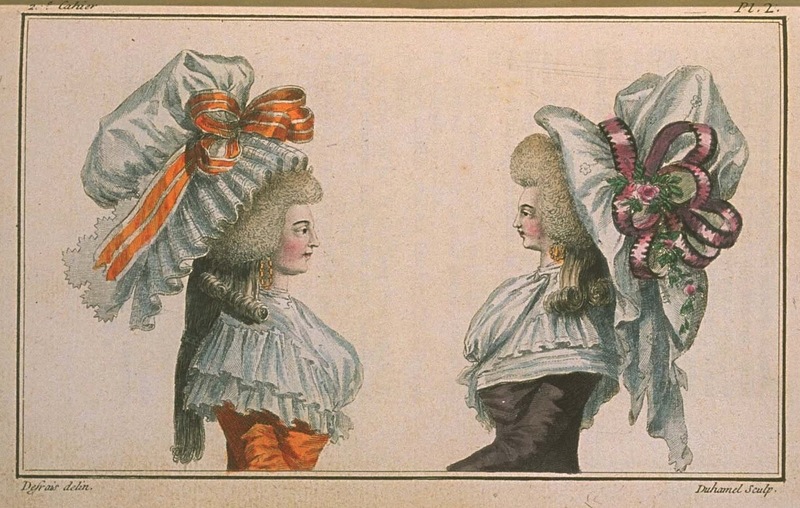 The baigneuses are worn in half-dress. Formerly they only served for the morning, to go out without being dressed, but today our Ladies hardly go out in the morning in night caps, trimmed with blonde or other lace, and in hair in rolls underneath, with two or three unrolled curls allowed to escape on each side.